It took some time for me to realize that Chasing Mavericks is more than just a visually stunning film about surfers riding very big waves. Anyone interested in watching exciting, beautifully photographed surfing will not be disappointed. But ultimately this family film (specifically aimed, I would say, at teens but appropriate and enjoyable for all ages) settles into a gently philosophical groove. It’s about pursuing something that seems impossible. In this case that means the giant-sized waves at Maverick’s, a treacherous area on the northern Californian coast. But those waves represent the heartbreakingly temporary nature of everything we cherish, including life itself. To say the process of bringing the story of surfer Jay Moriarity to the big screen was troubled is somewhat of an understatement. After a lengthy preproduction period, original director Curtis Hanson (an Oscar winner for L.A. Confidential; Best Adapted Screenplay) was forced to back out of the project only a month into shooting due to illness. While waiting to find out if Hanson would be able to return, the producers continued directing scenes with special permission from the Director’s Guild. When it was clear that Hanson would be unable to resume, another highly acclaimed director, Michael Apted, stepped in to complete the picture. Is it any wonder that the narrative suffers somewhat from a stop-and-start tentativeness? No, we can’t give a free pass to any movie that happened to have production difficulties. Is the finished product a good movie or not? 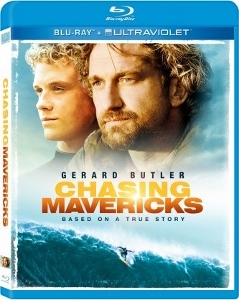 Honestly the real wonder is that Chasing Mavericks turned out to be a good movie indeed. The story is an adaptation of the early career of surfer Jay Moriarity, engagingly played here by Jonny Weston. The film opens with a prologue (largely invented by screenwriters Kario Salem and Brandon Hooper) in which a very young Jay (Cooper Timberline) is rescued from near-drowning by Frosty Hesson (Gerard Butler). Frosty is very much a real person (and participated as a consultant). After flashing-forward to the teenaged Jay, the story centers on his drive to convince Frosty to mentor him, training him to surf at Maverick’s. There’s really not much more to the plot, per se, but the details of Jay and Frosty’s lives are filled in along the way. Jay’s mom Kristy (Elisabeth Shue) is an alcoholic stuck in an abusive relationship. Frosty struggles to balance surfing and his relationship with his wife (Abigail Spencer) and young daughter. There’s also a love interest for Jay, the slightly older neighborhood girl Kim (Leven Rambin). Even though the real life Kim and Jay eventually married (Kim Moriarity also served as a consultant on the film), their relationship is depicted in its early stages. Some of these plot elements are admittedly underdeveloped. I’m not the first person to say that Mavericks sometimes feels a bit flat during dialogue-based scenes. But if some of the character interactions seem a little by-the-numbers (Elisabeth Shue, in particular, is sorely underused), the movie always springs to life anytime it ventures out to the ocean. Depending on how much you already know about the real lives of the characters in Chasing Mavericks, the movie holds some true surprises that lend a serious sense of gravity. Jonny Weston and Gerard Butler display good chemistry, with Butler succeeding in making Frosty a slightly reluctant surrogate father to Jay. Butler’s commitment to the role involved doing some of his own surfing, which resulted in the actor very nearly dying. Butler was hospitalized after being pulled under by strong waves. He was rescued in the nick of time, but it was apparently an extremely close call. The Blu-ray looks fantastic, with the digital cinematography boasting a high level of fine detail. The surfing footage looks tremendous. The surfing scenes are also the highlight of the DTS-HD MA 7.1 mix, with lots of immersive effects. I can’t find any room for criticism in either the audio or visual presentation. The special features include a really insightful audio commentary by co-director Michael Apted along with two of the film’s producers and a number of ten-minute featurettes (the best of which focuses on the Jay Moriarity). There’s also a short selection of deleted scenes. Between the directorial switch, Butler’s hospitalization, and even the loss of several expensive high definition cameras while the surfing scenes were shot, Chasing Mavericks was a struggle to produce. The result is a film worth watching to learn about an inspirational figure, well known among surfers but not so much outside of that specific demographic.